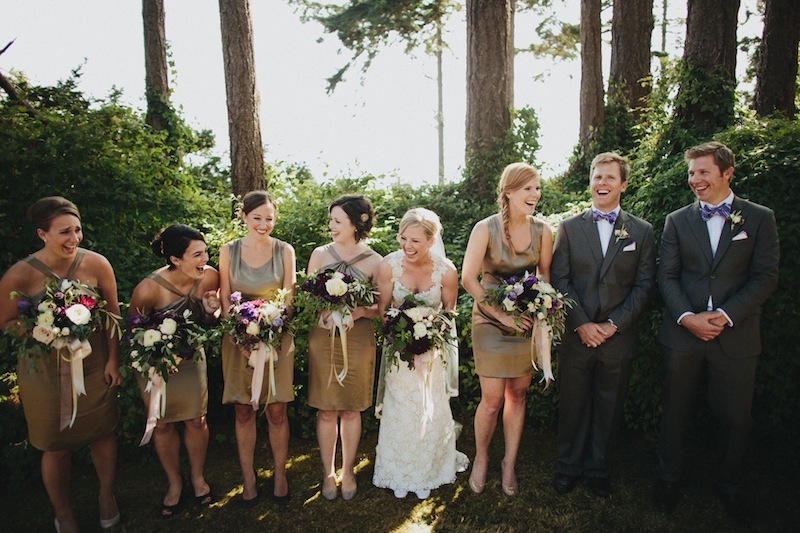 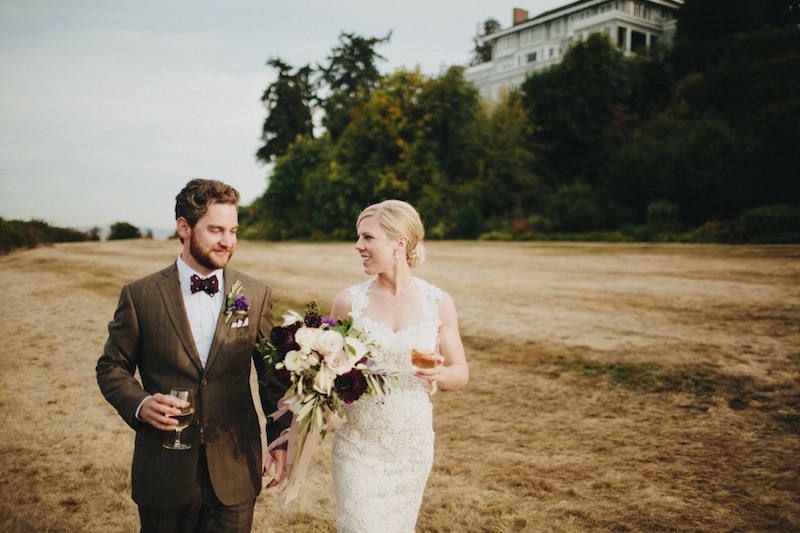 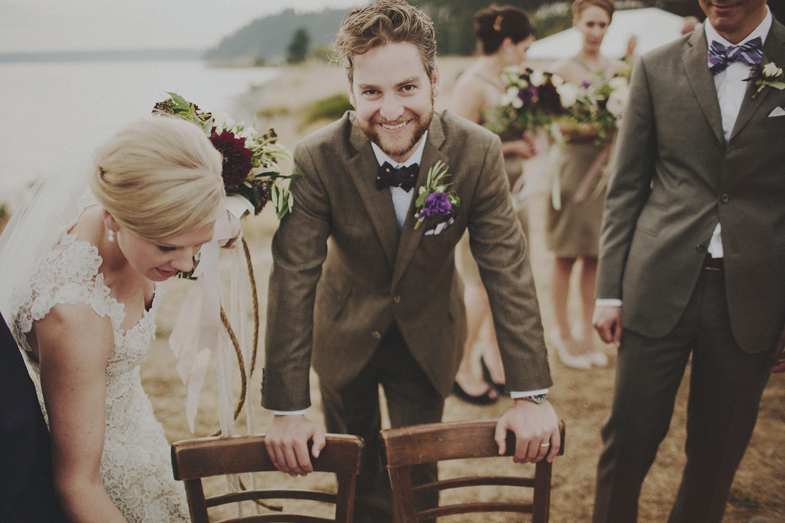 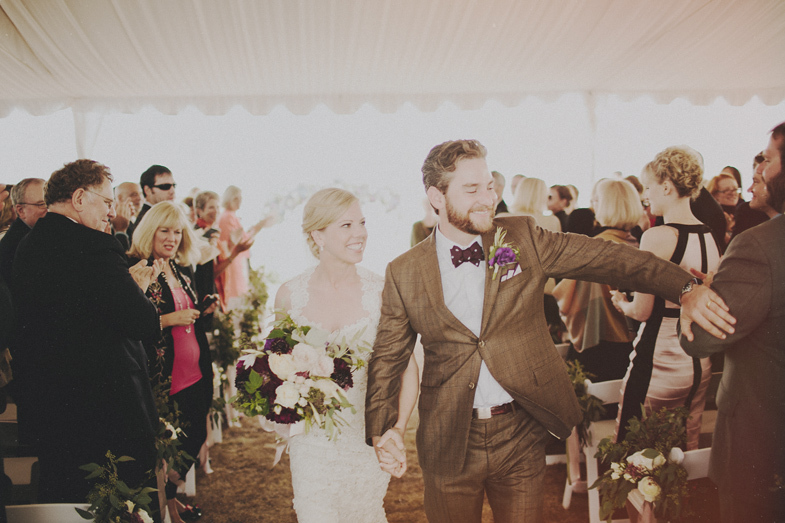 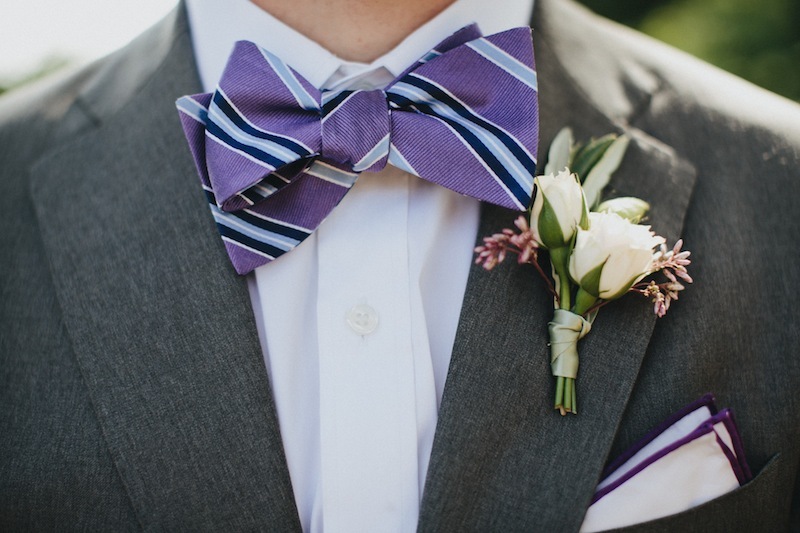 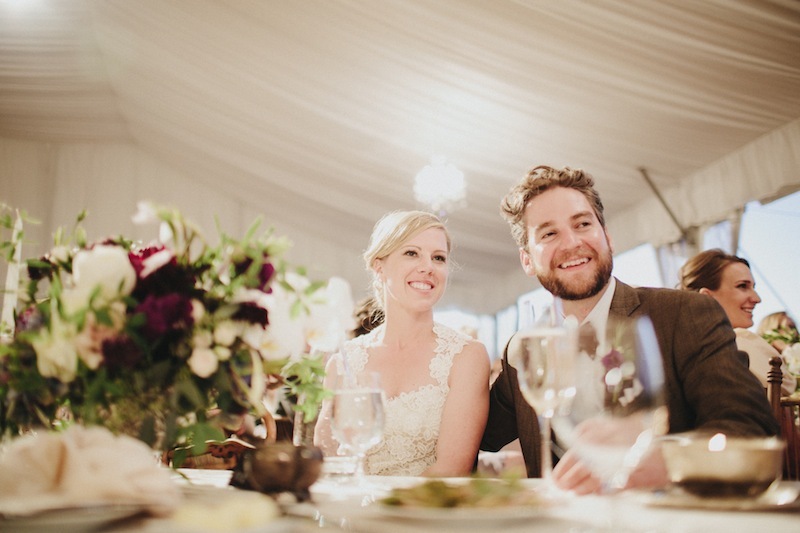 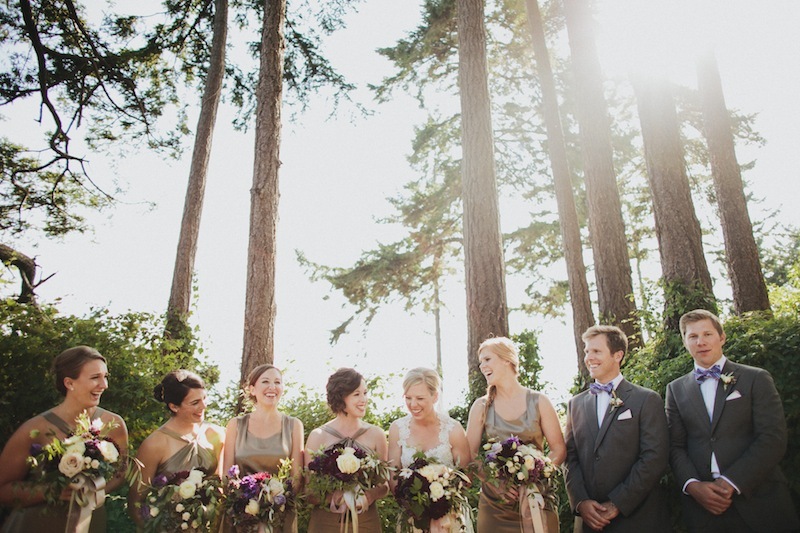 Gwyn and John’s Gatsby inspired wedding was a labor of love for a large team of Seattle wedding vendors. 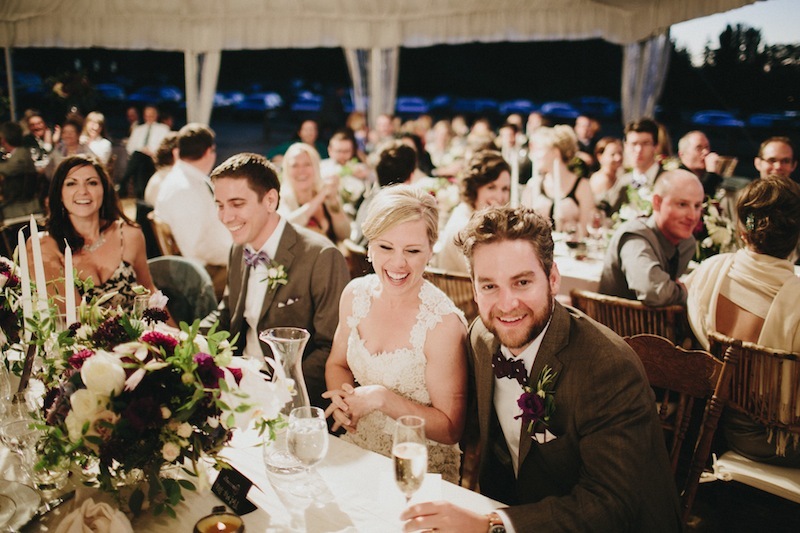 I started working on the design of their wedding a full 18 months prior to the big day last September. 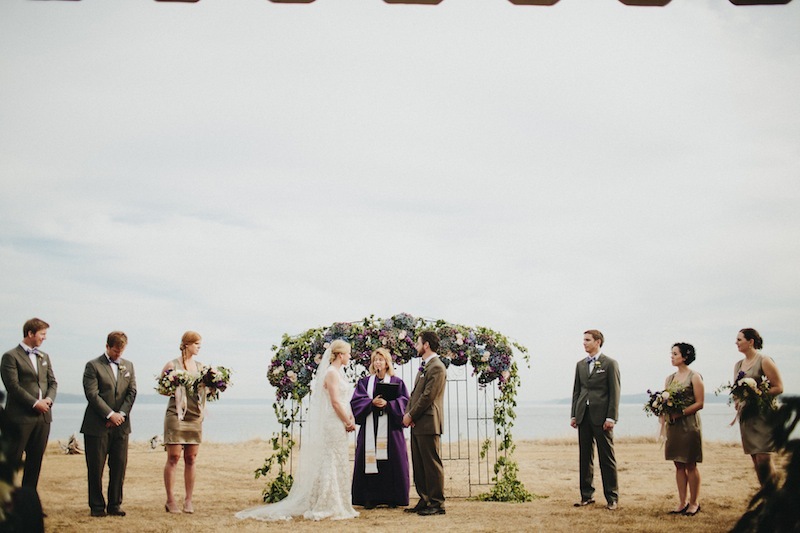 The bride and groom wanted to celebrate the Pacific Northwest island location but still give guests the feeling of being inside a 1920’s ballroom. 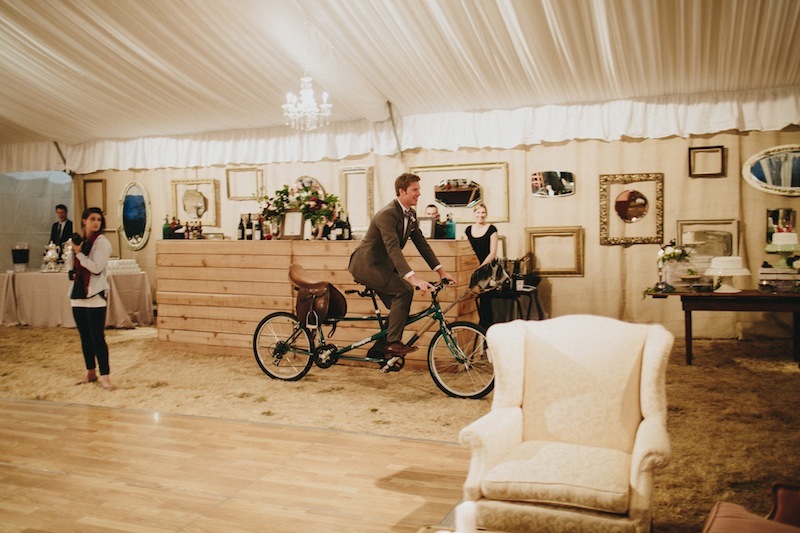 We set up three separate tents for the ceremony, cocktail reception and dinner reception each decorated in a different but coordinated fashion. 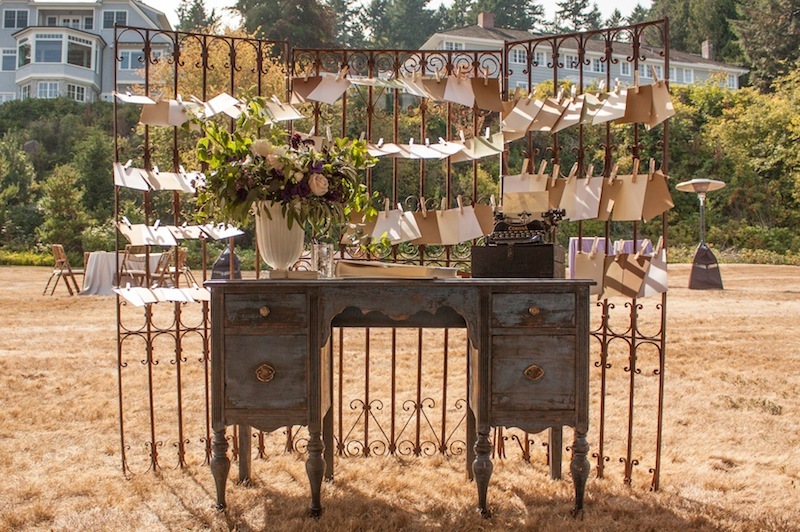 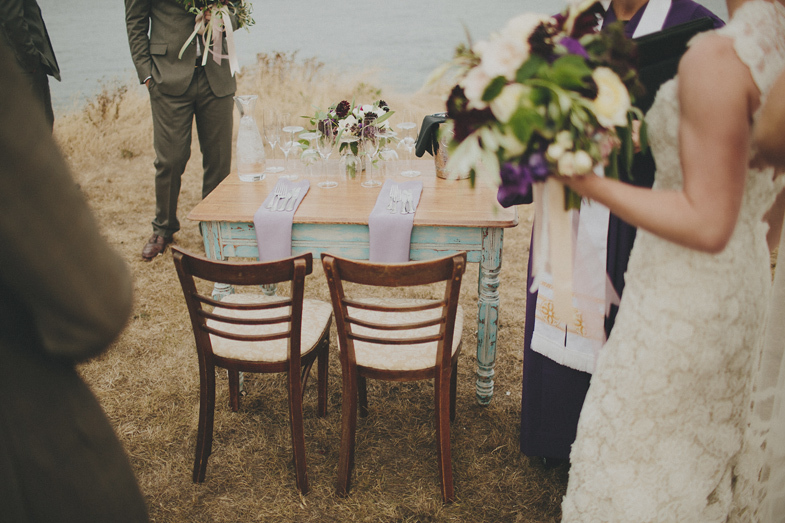 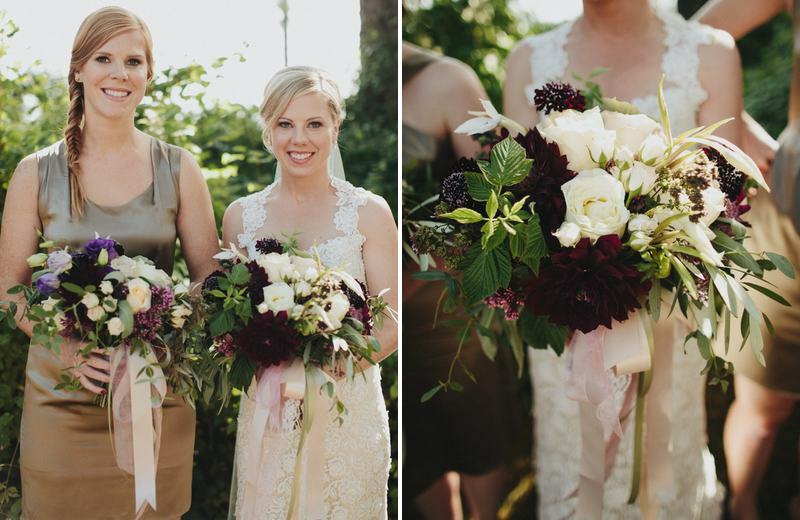 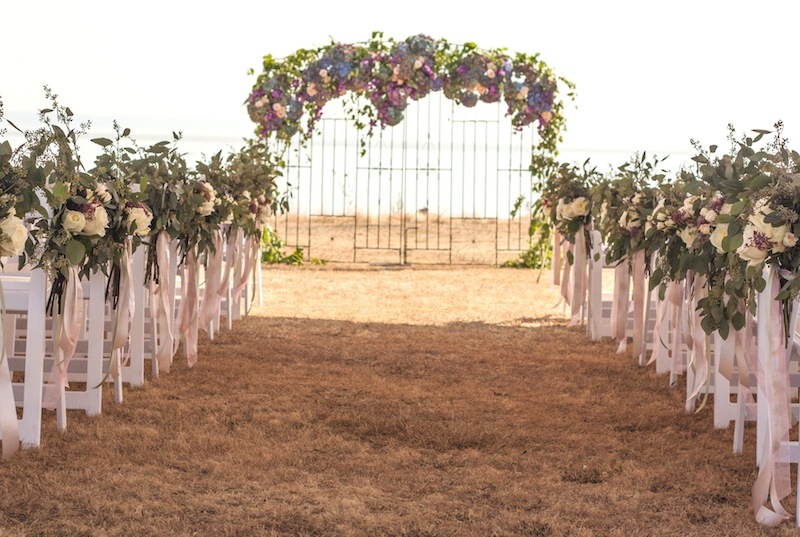 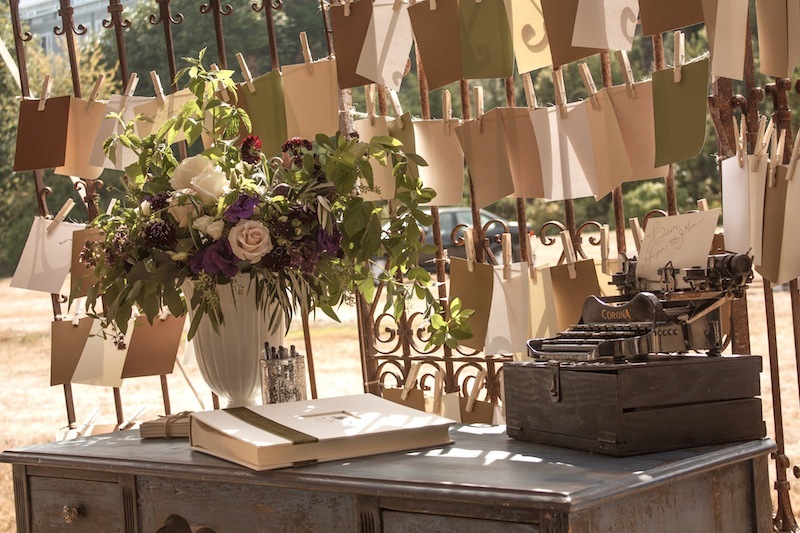 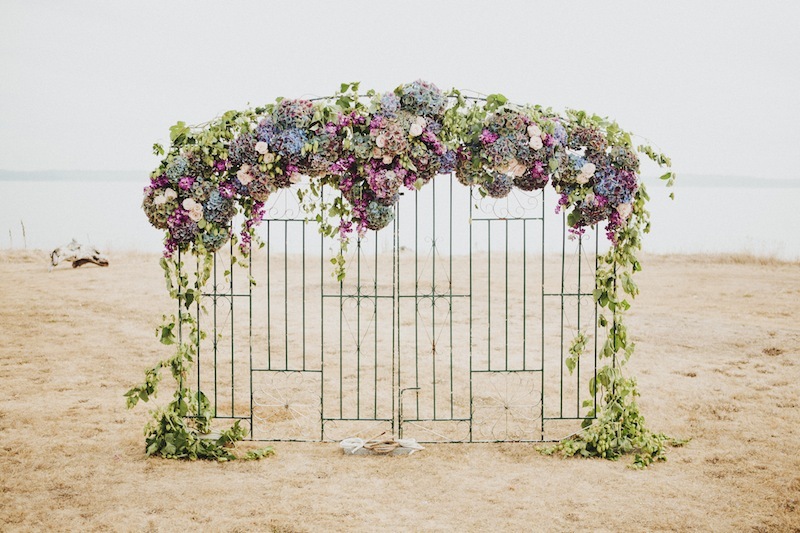 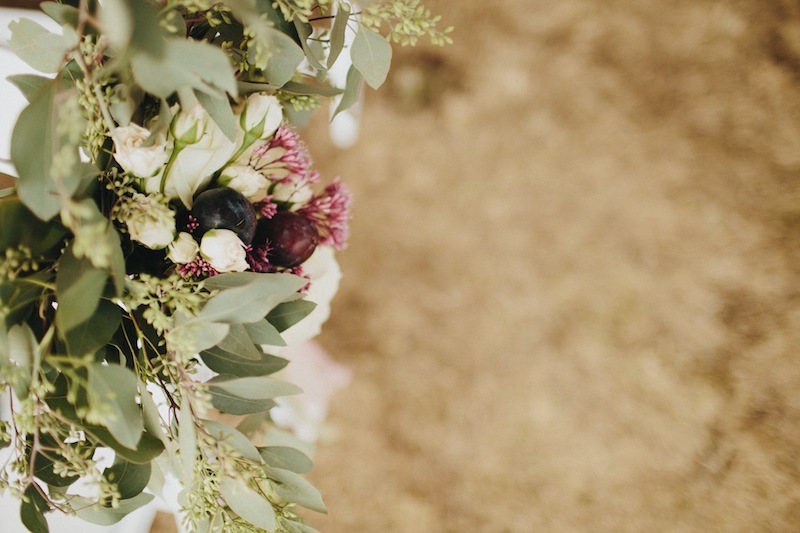 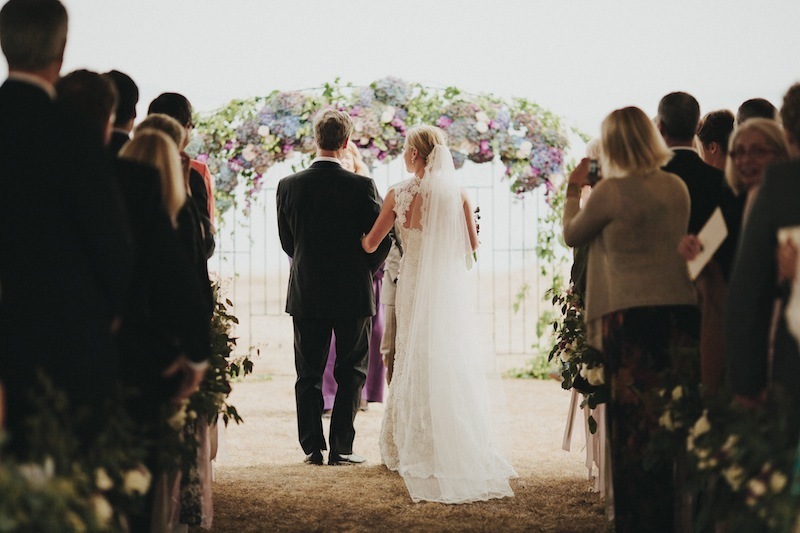 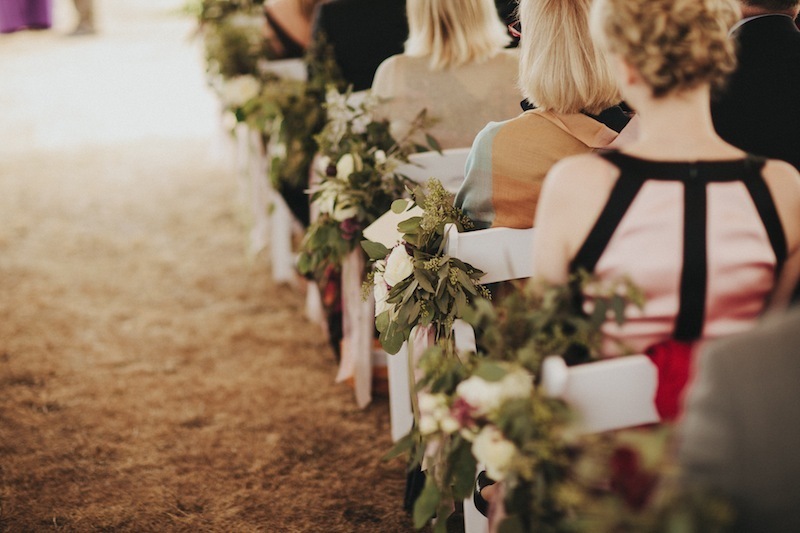 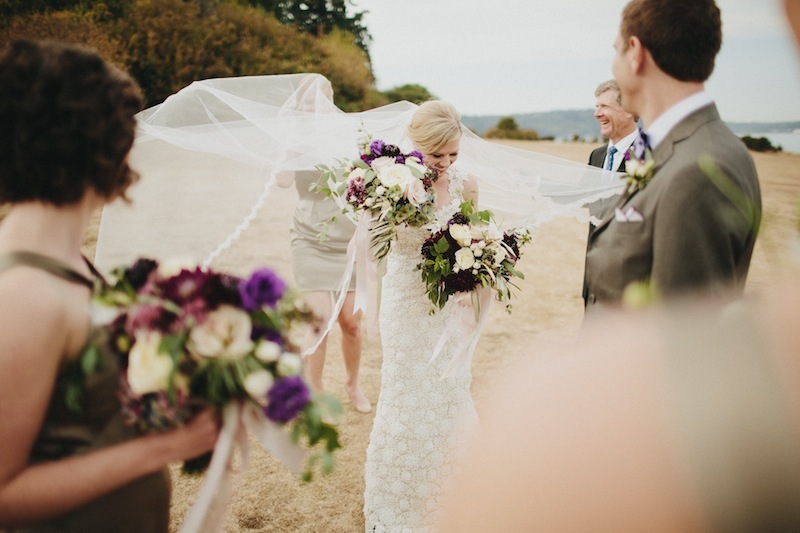 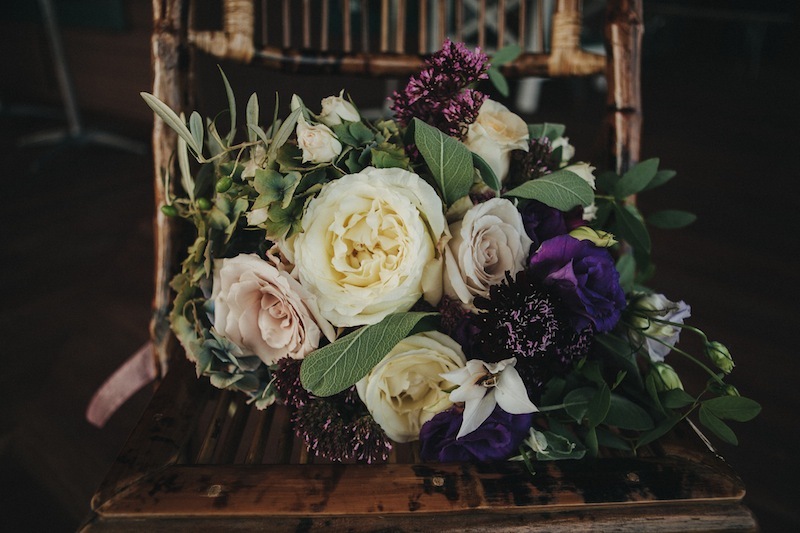 For the ceremony, antique English iron gates backing onto the Puget Sound were draped with antique hydrangea, hops, stock and quicksand roses while guests walked an aisle filled with plums, garden roses and herbs. 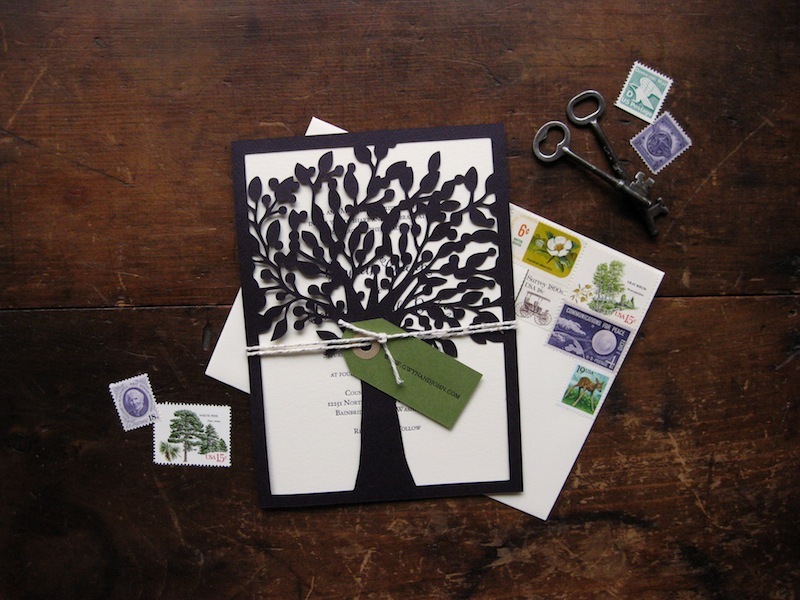 We worked with Sally Balt at la Happy to create a custom “kissing tree” die cut motif for the invitations and programs in an elegant eggplant and cream package. 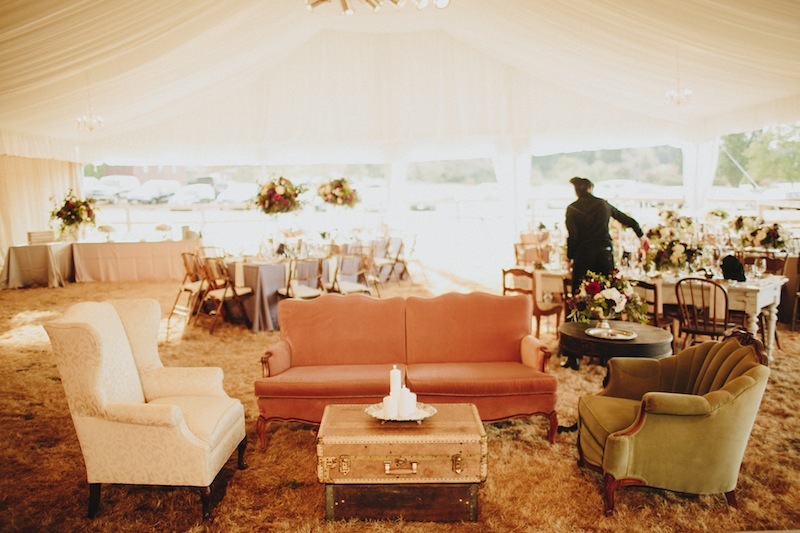 In the cocktail tent we set up two soft seating areas of vintage sofas and coffee tables decorated with flowers in McCoy pottery and candles on vintage silver trays. 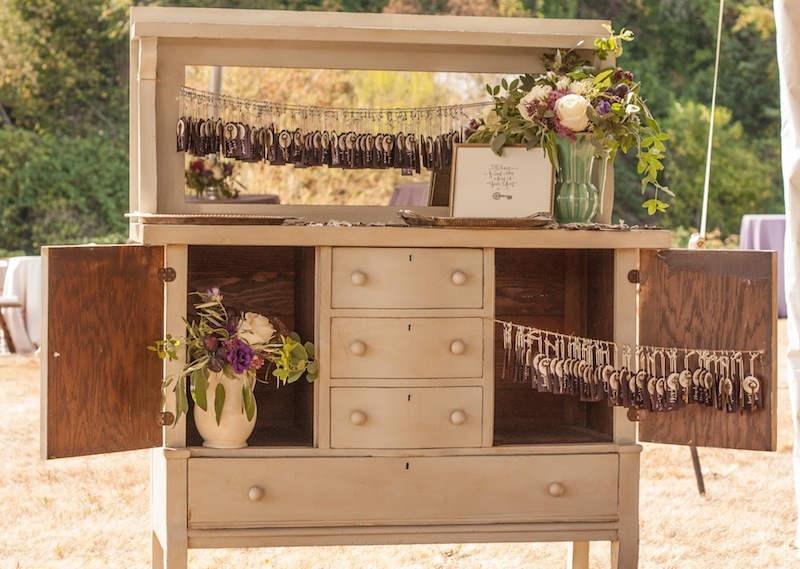 An antique typewriter on a blue desk invited guests to leave messages for the couple while an antique sideboard displayed skeleton keys with hand lettered key fobs to direct guests to their seats. 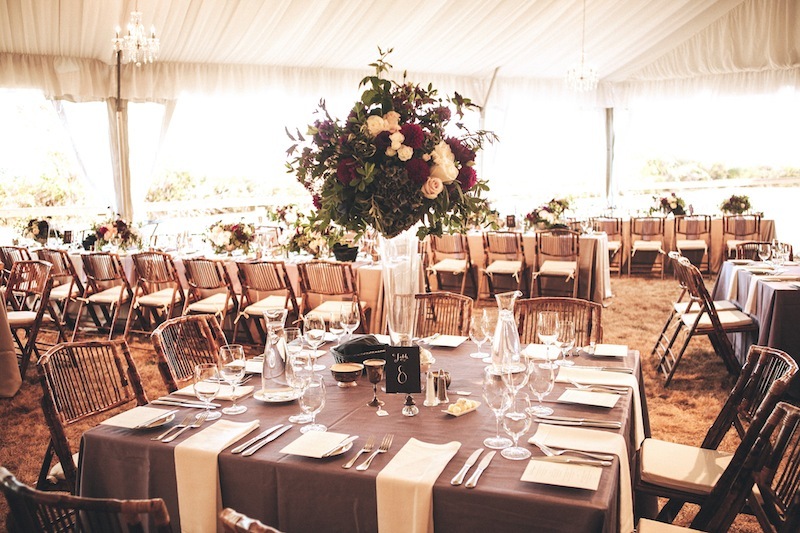 Moving into the reception tent guests were greeted by long banquet tables covered in taupe and purple linens, silver candelabras and lush floral arrangements in silver urns. 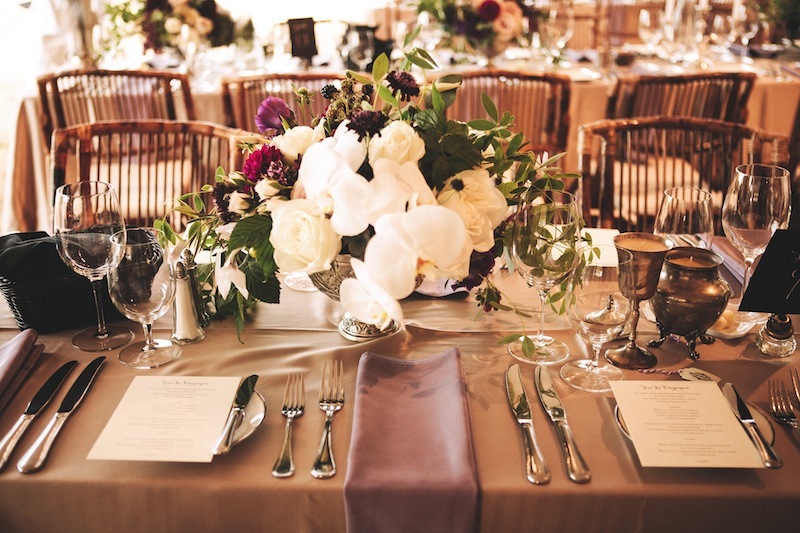 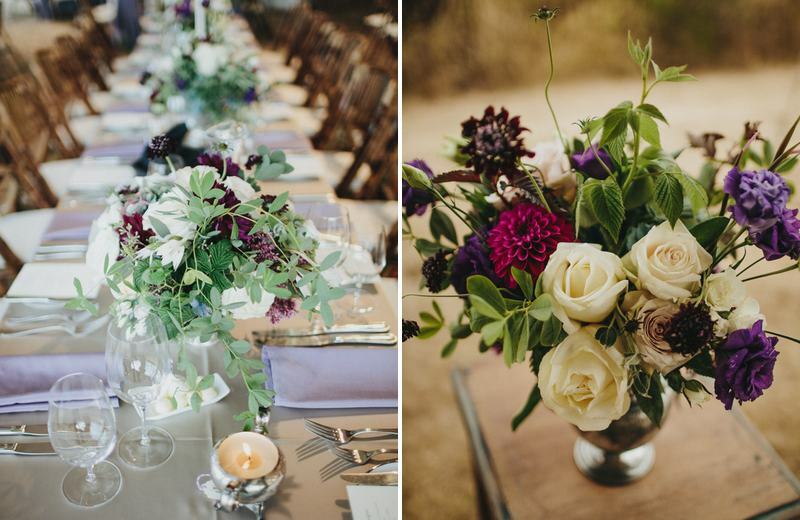 These were offset by square tables with towering glass vases topped with large arrangements of dahlias, phalaenopsis orchids, blackberries and garden roses. 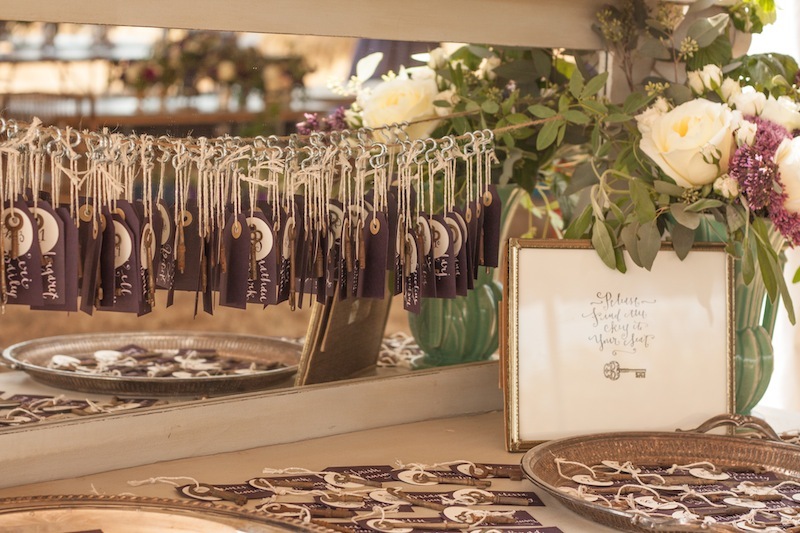 The bride collected antique silver pieces on Ebay and made candles for each one that guests were invited to take with them as favors. 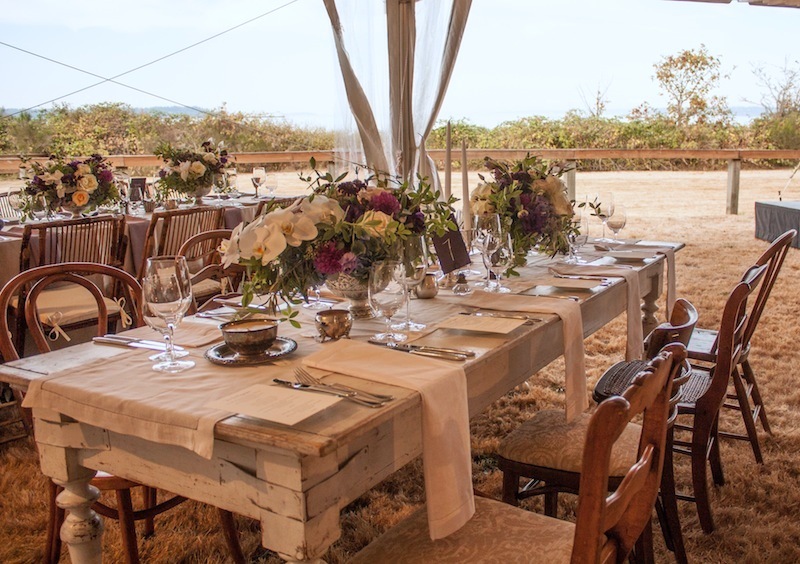 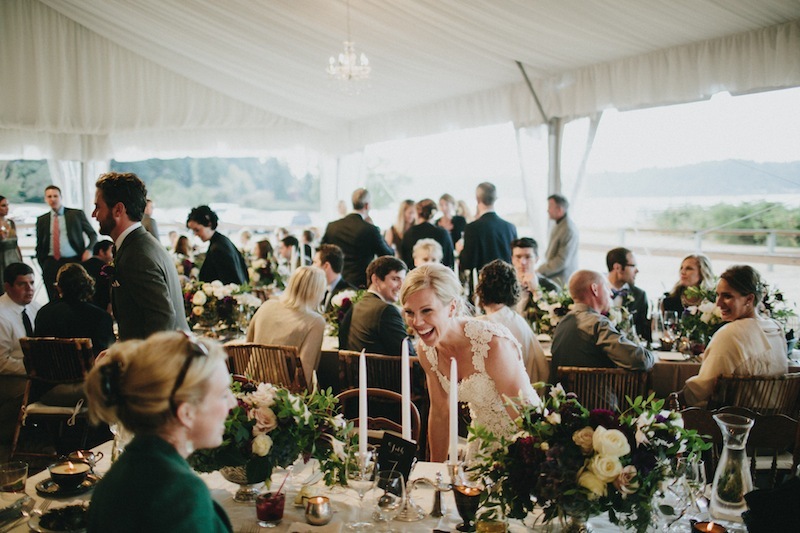 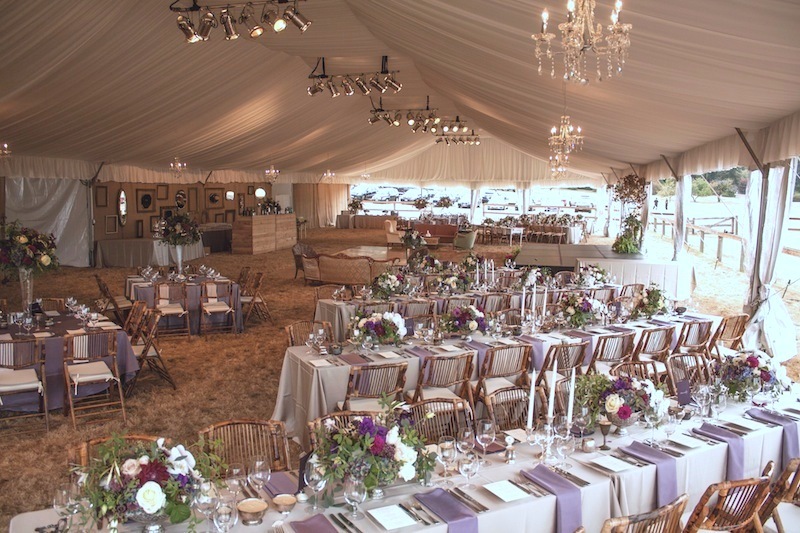 Glass chandeliers provided the lighting while the back wall of the tent was draped in custom burlap panels and hung with vintage mirrors reflecting the Puget Sound and Seattle across the water. 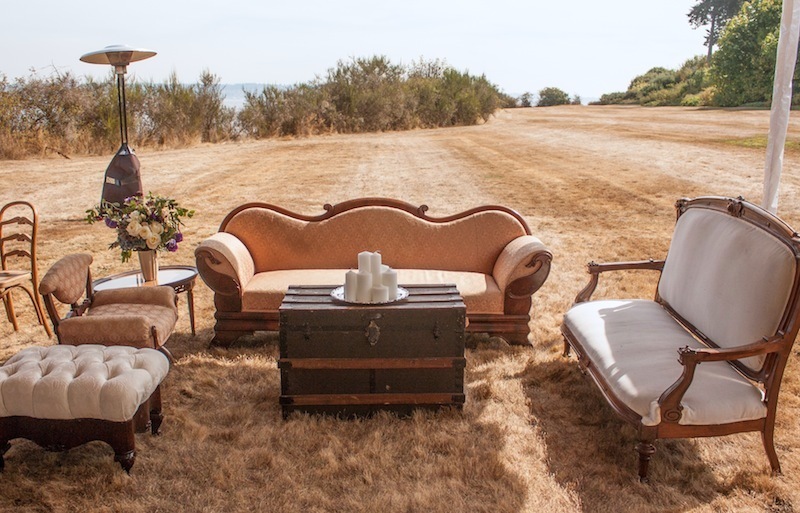 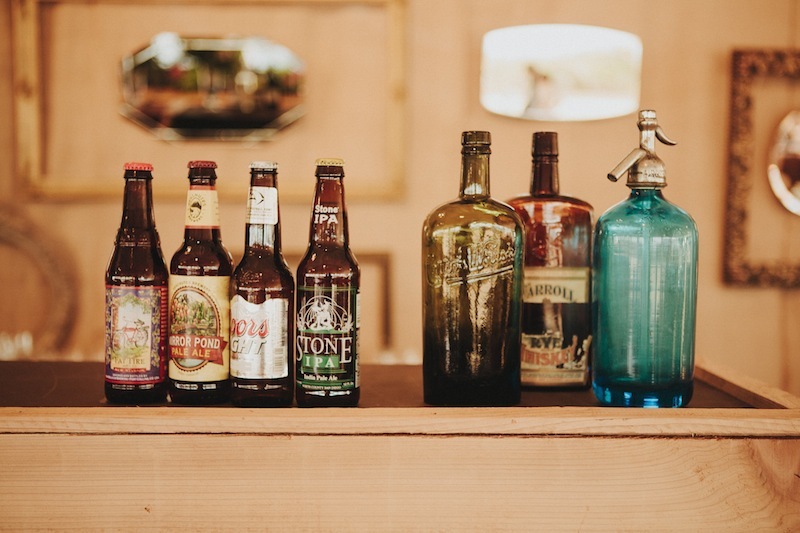 We decorated custom cedar bars with antique liquor bottles and offered micro brewed NW beers while guests reclined on more Gatsby style soft seating and a wedding painter documented the scene.